Currently, PayPal is the most used online payment system. It allows people to transfer money over the Internet, while taking a fee for the process. 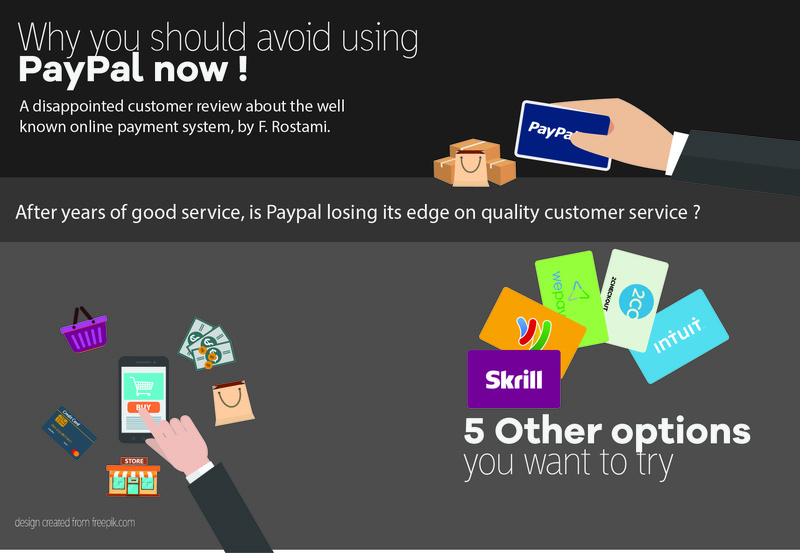 Despite the fame and popularity of PayPal, users have experienced a lot of problems. Where PayPal was once the go-to solution, many users are now serious looking at alternative solutions. What are the general problems? PayPal can freeze your account at any time, without prior notice, if they believe you are breaking the terms of service. Sellers on PayPal often complain about the process after a transaction. PayPal may hold the funds for up to 21 days after the transaction has taken place. The reason behind this is to make sure that there are no problems with the sale. For small businesses this can have a serious impact on cash flow. Most of the online payment systems have some fee attached to them, to make money. The PayPal fees for each transaction appear to be at the higher end of the spectrum while, in addition to this, they also command a flat monthly fee. One of the biggest risks you take by using PayPal services, especially transferring large amounts of money, is the safety of the process. Paypal does not have the same kind of protection that bank offers. This makes Paypal more vulnerable to fraud. Customers attach a lot importance to customer service. PayPal, despite being a large company, has a poor customer service record. Just finding a contact number, on their website to make contact, is very difficult. Second, after sending them an email you will always receive an automated response instead of a genuine reply. The final and most important part of the customer service, the helpdesk on the phone, are quite vague and unhelpful. PayPal is a company that deals in the majority of countries all over the world and also with a lot of different currencies. The problem facing businesses that are dealing internationally, is that PayPal doesn’t deal in all currencies. It deals in 23 currency types but still misses out some major currencies, such as Indian Rupee.This is strange given that India is one of the fastest growing markets. PayPal makes its money by charging fees for using its services. Usually the free for transferring money from PayPal ranges from 0.3% to 1.0%. This may not sound as much but it soon adds up if you are transferring large amounts of money. The fees for transferring from a debit or credit card are even higher at 7.4%. Why are the transaction costs so difficult to understand? To change currency via PayPal, is just as expensive as it would be at a local bank. The difference between PayPal and a bank is that it is very difficult to find out what level of commision you pay on exchanging currency. PayPal has a low success rate when it comes to resolving customer issues. Big financial companies have an average problem resolution rate of 90% to 95%, while PayPal’s rate sits significantly lower at 70% to 80%.